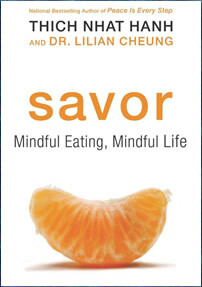 Savor: Mindful Eating, Mindful Life is written by Vietnamese Zen Buddhist master Thich Nhat Hanh, and is coauthored by Harvard nutritionist Lilian Cheung. This book combines modern nutritional information with ancient wisdom to create a weight loss program based on the Buddhist practice of mindfulness, which involves being fully aware of everything that is going on within us and around us. The authors commence by introducing readers to “The Four Noble Truths of Healthy Weight”. Being overweight or obese is suffering. You can identify the roots of your weight problem. Reaching a healthy weight is possible. You can follow a mindful path to a healthy weight. Simply by consistently paying attention to what you are eating, you will naturally eat less, and over time this should result in effortless weight loss. The book explores the concept of mindful eating in great detail, devoting an entire chapter to the topic of eating an apple. Some of the practices recommended include honoring your food, engaging all six senses, serving modest portions, savoring small bites, chewing slowly and eating regular meals. Mindful eaters are encouraged to adopt a primarily plant-based diet because it is better for your health, as well as for the health of the planet. Whole grains are especially recommended because studies show that people who eat at least two servings a day have a 20 to 30 percent lower risk of heart disease and diabetes. Conversely, you should limit your intake of refined grains, white potatoes and sweets because these foods disrupt blood glucose balance. The authors encourage complete abstinence from alcohol to enhance mindfulness and compassion, but if you are unable to completely stop drinking you should reduce your intake by at least a third and if you are going to drink, be mindful. A large part of the book is devoted to meditation with instructions for how to perform different meditations including a waking-up meditation, teeth-brushing meditation, hurrying meditation, smiling meditation, traffic-jam meditation, internet/email meditation, cooking meditation and more. Vegetables, fruits, whole wheat bread, oats, brown rice, millet, barley, quinoa, beans, tofu, nuts, seeds, soy milk, tea, coffee. The authors recommend adhering to the US guidelines for optimizing health benefits with exercise, which consists of two and a half hours a week of moderate-intensity aerobic activity, or one hour and fifteen minutes of vigorous activity. Strength and flexibility exercises are also important. Some of the potential barriers and challenges to becoming physically active are discussed and practical strategies are offered to help dieters overcome them. The connection between mindfulness and exercise is explored and included is a walking meditation, which helps you in the process of becoming fully present in the moment. The book also includes a few other “mindful exercises”. Savor: Mindful Eating, Mindful Life retails at $15.99. Encourages the consumption of a plant-based diet, which has been associated with a reduced risk of heart disease, cancer and diabetes. May assist dieters who struggle with emotional or mindless eating. Regular physical activity is recommended. Flexible approach that can be adjusted to suit various goals and lifestyles. References scientific studies to support the information presented in the book. Addresses the importance of stress management and a positive attitude for the maintenance of health. Includes a variety of different meditation techniques. Some dieters will require a more structured approach. Nutritional guidelines are lacking in clarity. Not all dieters respond well to a high intake of whole grains. Spiritual approach may not appeal to all readers. This mindful eating diet is based on the Buddhist practice of mindfulness as it applies to developing a healthy lifestyle approach to weight loss. Increasing awareness of daily habits related to eating, physical activity and stress management, will naturally promote healthier choices and behaviors that, over time, will lead to the achievement of ideal body weight and improved well being.